Concealing a pistol with an attached weapon light isn't easy, but the Aker 167 Nightguard Holster accomplishes it in style. Its rear belt slot and anchor attach securely to a belt up to 1.75 inches wide, holding it high and close to the body to provide both concealability and easy access. It is made from premium cowhide for superior durability and wear resistance, and features a reinforced opening to make reholstering easy. The specially shaped holster pocket includes a full-coverage section for the tactical light, providing a high level of protection for the delicate lens. Its built-in thumb break provides secure retention, backed up by an adjustable tension screw for a snug custom fit. Best holster I ever bought. will this holster work with a springfield XD 45acp,and will this holster retain the pistol securely without the light connected to the pistol.will it work with a TRL-3 LIGHT. Holster is made to fit the M3, TLR-1, and TLR-2 and will require the light to be mounted for a more secure hold. Hi. 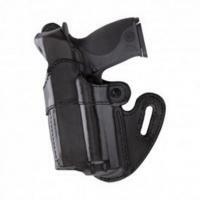 I really want to buy this holster, but I have the Sig Saur P229 with the M3 tac light. Do you think any of your holsters would fit the P229? I saw many other Sigs, but not the P229. There are no P229 fits for this holster. The P220 and P226 are full size sigs which should fit the P229 but there will be a gap between the hammer and the strap.